When I finished hanging a fresh harvest of lungwort leaves in my kitchen window this week, I came to three telling realizations. #1: I realized that I’ve posted a few things already about what’s hanging in my kitchen window. First, I talked about basil seed; next, basil leaf; then stevia. 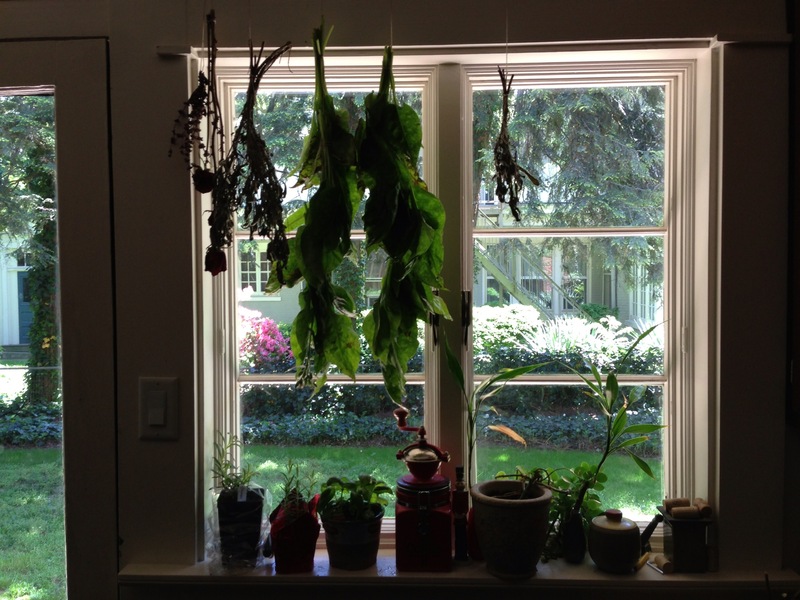 #2: I also realized that I have hung many things in my kitchen window the past few months that haven’t received a post: sage, roses, and my all new Costa Rican seed-saving gourd (more on those later, no doubt). #3: My third realization was more poetic: this kitchen window often acts as a window into the Hipsterly habits of this House Husband. There’s always a frugal/industrious/resourceful reason for my efforts to preserve the various things that hang in my window. I have an obligation to share these things. So starts this recurring “series” in which I will detail the items in my window and the ways I plan to use them. Back to the lungwort. Over the winter, I was looking up different kinds of teas that we could add to our little rooftop garden in the spring. I found some information on lungwort, which grows in large quantities in our backyard already. I was taken aback by all the benefits that this plant offers when dealing with the ailments of the lung: coughs, congestion, asthma, etc. It can also be used as a poultice on open wounds. This is a plant all hipsters should love: it’s European in origin, and you’ve probably never even heard of it. In fact lungwort is given credit for helping to curb the Black Plague in Europe in the 1300s. Who knew? I do, now. Lungwort flowering in early April in my backyard. Fast forward 30 days, and the lungwort in our backyard is loving life and growing like crazy. This week I harvested a huge amount of large leaves and tied them like a ristra of chiles to proudly hang in my window. Now I can’t wait to get a cough again…and that’s what’s hanging in my kitchen window.